[First things first, I rate movies based on what I see! And not what I could have seen. I have read reviews where critics mostly criticize the movie saying that the movie is good but it could have been better. Their statement is accepted if the movie fails to leave its proposed impact on the moviegoer. However, say, a movie is made to make a viewer laugh, and then you can’t criticize the movie saying that it did not make you cry. Reviewers say this movie, Soundtrack lacks humor in first half and it’s predictable in second half. In recent times, Bollywood has witnessed many melodramatic remakes (most of them, remade from South Indian movies). Soundtrack, though a remake of Canadian movie It’s all Gone Pete Tong (officially mentioned in the end credits of the movie), is thankfully not over-the-top. The movie is narrated in a documentary style, seldom taking interviews of many famous music personalities. The movie has an intriguing screenplay, where a viewer is supposed to get connected with the movie and its character and it happened to be the case with me. Rajeev Khandelwal as Raunak Kaul is just marvelous. He is thoroughly in synch with his character and he has proved his versatility with this movie. Soundtrack is all and all a movie for Rajeev Khandelwal fans. 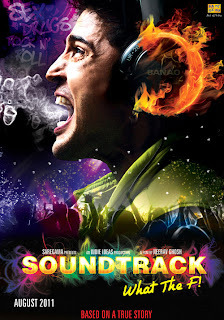 Soundtrack, has very good music but the background score of the movie sounds a bit pale. Two songs, Naina Lagey and Banao are placed wrongly in background score, which can’t be digested in a musical drama. The “Johnny Joker” element added to make it a bit artistic movie, is appreciative, but not needed. Camera works is fancy. Cinematography is brilliant. Direction is good, not excellent. The movie could have been narrated in a heroic way but the director chooses a subtle way (not to misinterpret as a mediocre way) of narration giving it an artistic touch rather than commercial appeal. To conclude, there are only two loopholes in this movie, first, no strong implication of mood of the movie. Second, background score of the movie. Soundtrack, thus, deserves accolades and appreciation of viewers. Folks, don’t waste your money and time in the other movies this Friday, just go for this one! Highly recommended! Rajeev Khandelwal is brilliant. He transits well from a DJ hunk to a deaf musician. Mrinalini Sharma is unbelievably hot. Soha Ali Khan acts well (yes, you read it right). Both the ladies represent contradictions in Rajeev’s character. Mrinalini makes you go high in first half and Soha makes you feel dry in second. Mohan Kapoor is very good as a Casanova kind of manager. Ankur Tiwari (yes, the singer-composer) and Siddharth Cuotto (yes, the singer) are noteworthy. Manu Rishi is wasted. Story and screenplay (majorly) is adapted from It's All Gone Pete Tong so not to credit much. Dialogues are fresh, crisp and hap devoid of any melodrama, which is commendable. Editing by Sanjey Roderick and Ambar Vyas is tight. Screenplay is intriguing and fast paced (at some extent, inconsistent too). Cinematography is fine and high on production values. Music is good. Read the Soundtrack music review here. Background score is okay. Direction is good, still a long way to go. I hope to see more of him soon. Don’t trust the reviewers that rate Bodyguard as first class, and do go for this movie. You won’t be disappointed, if you love good cinema.